Check out our NEW blacker-than-black liners. 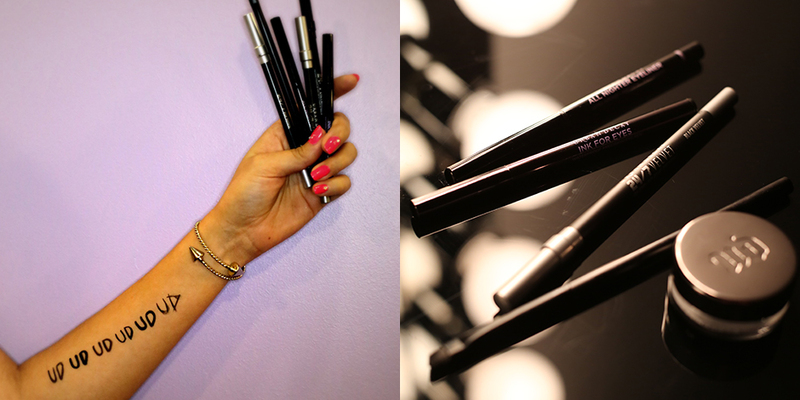 FOUR new black liner formulas with insane black payout. Whether your weapon of choice is a velvety pencil, a felt-tip pen, a twist-up pencil or a poured cream liner, we've got the liner you crave. perverse addiction to black eyeliner. got the black liner you crave. Expand your eye arsenal with our blacker-than-black liners. An all-in-one weapon for super-precise lines or smudged, smoky lines, our long-lasting, waterproof cream liner features triple-black pigments—for the purest, deepest, most intense black color imaginable. For the perfect application, try our new Perversion Angled Brush. Create envy-inducing, artistic lines with ease. Ultra-waterproof and crazy-precise, our fine-tipped pen draws glossy, sharply defined lines that last all day. Draw ultra-shiny, intense lines with ease. (No sharpener required!) Our creamy formula twists up, glides on and flashes down to a long-lasting waterproof finish that won’t budge. Draw liquid lines so sharp they could cut glass. Our slender brush creates lines that are razor-thin or thick, even and bold. This cushiony, creamy, award-winning pencil glides on soft, yet delivers extra-long, waterproof wear. A must for smoky-eye fanatics: an ultra velvety, plush version of our creamy, waterproof 24/7 formula. Create perfectly blended-out or rich, defined lines. Post your best UD liner looks to Instagram and tag them with #PickYourPerversion.